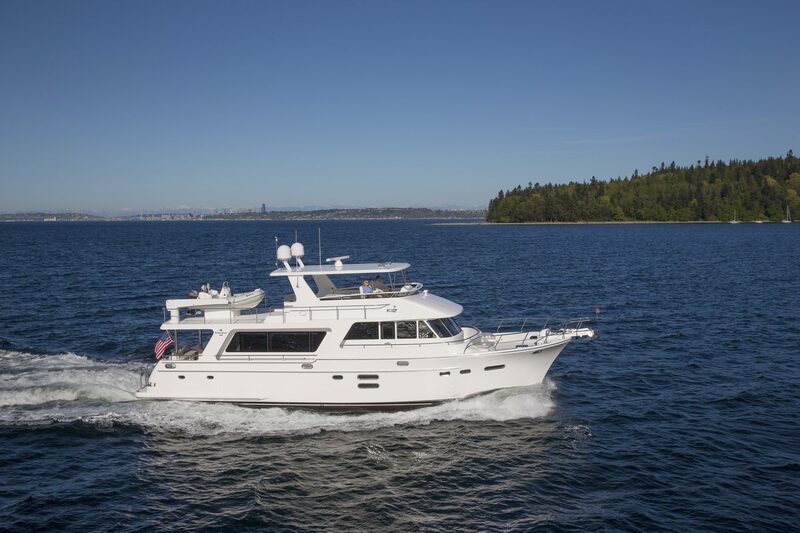 The Endurance 658 is one of our most popular in the long range cruising series. 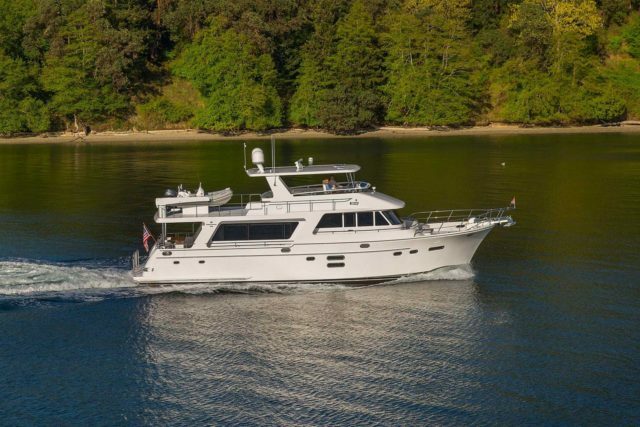 A true model of performance and design, the Endurance 658 has been lauded as “80 feet of yacht in a 65 foot hull” by BoatTest.com. Built-in dinette/cruising settee with a redwood burl topped table (glass). Storage drawers built into the table base. $50,000.00 allowance to cover the purchase cost of all furnishings, soft goods (bedding, towels, carpeting, et cetera), dinnerware and installation costs. $50,000 allowance: Electronics - Garmin 7600 series - radar, chart plotter, touch screen monitors x 5, autopilot, Depth/Speed/Temp, GPS, VHF radio x 2, AIS & Magnetic Compass. Note: the customer can choose the brand of electronics, the total allowance is $50,000.00. We were in the process of looking for a new 65-70ft cruising yacht that we could keep on the east coast. On a recent trip to Roche Harbor we met Robert Fiala, who was just closing the display of their new Endurance 658. We expressed an interest to view it and without hesitation he offered to open the boat and let us have a look. It was clear that Robert was very knowledgeable and as we walked through the yacht we became more excited, the Endurance had every feature we were looking for, virtually no compromises. As we developed more interest, Robert canceled his return flight home and extended his trip to accommodate a sea trial, which shortly lead to a contract and completed sale. We want to compliment Robert and his HYG team. They are extremely professional, responsive, transparent and honest. They also addressed every detail with speed and efficiency and made buying a yacht easy. 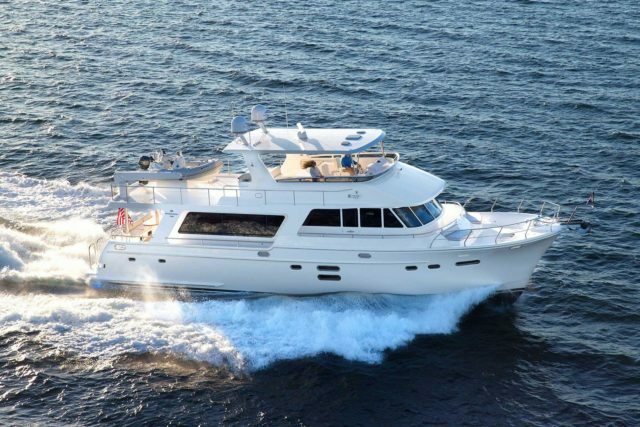 We are thrilled to be the new owner of an Endurance 658 and excited to be part of the Hampton family. This is my experience with buying and building my Hampton Endurance 658. The reason I chose a Hampton yacht is because of the quality and performance of the Hampton Endurance. I use my yacht in the Caribbean where the sea is pretty choppy and the Endurance is made for these conditions. 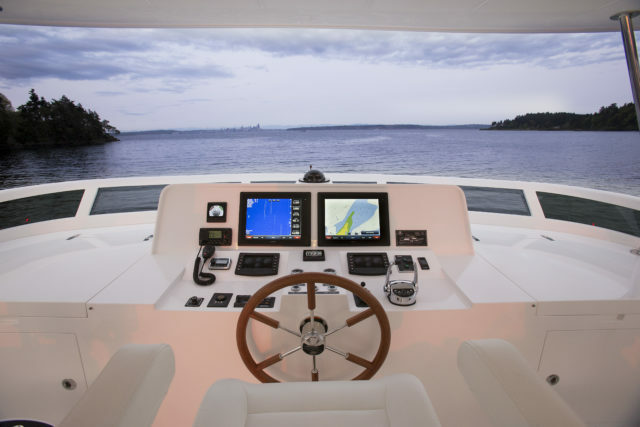 One of the important things for me on my yacht was the the layout and looks. I prefer the more European look and open plan. After visiting the Yard in Shang Hai with a good friend of mine and working for 3 days with you and Jeff on the looks and layout we managed to work out a good floor plan. The flexibility of the Yard and Jeff’s and your cooperation gave us this result and it came out exactly the way we liked it. My yacht looks very good, open, clean and European. After almost 2 years of using my yacht in the Caribbean I still love the handling of the Endurance and the comfort she gives us. This letter serves as a thank you on behalf of the professional services I have received with Hampton Yacht Group and Robert Fiala. It has been a dream of mine to own a yacht that I could one day call my own. I knew that being able to find a dealership that could accommodate my specific needs and expectations would be a daunting task, and I would be lying if I admitted that I wasn’t nervous when searching for the right one. My wife Emma and I visited quite a few dealerships, but we just were not able to locate one that we both felt comfortable in doing business with. And then we came across Hampton Yacht Group in Seattle, which we had flown into from our home in Miami. 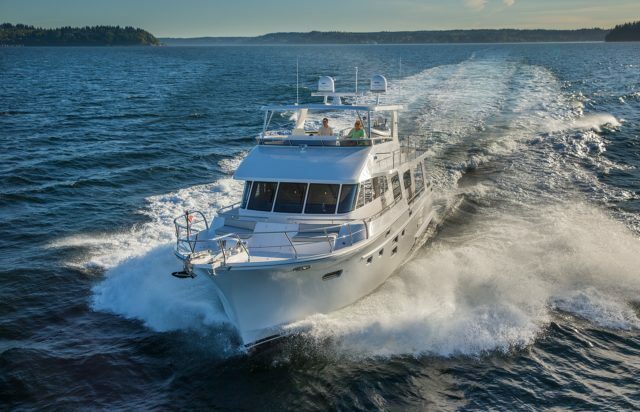 We felt comfortable with Seattle’s Hampton Yacht Group from the very beginning; from the warmth & hospitality to the professional knowledge and services. One individual who stood out for me in particular was Robert Fiala. Mr. Fiala is a stand up man who I felt completely comfortable with in making this deal happen to purchase my new Endurance 658 yacht. As a businessman myself, who has made deals with hundreds of people and personalities, I can recognize when someone upholds a high level of professionalism. From start to finish, I could not ask for a better individual and a more pleasant person to get this deal done with. Mr. Fiala always made himself available to me and was able to make the whole process smoother than I thought ever possible. It is my recommendation that Hampton Yacht Group strive to hold their employees to the utmost highest standard and professionalism, with Mr. Fiala being a prime example of the type of person that makes a business succeed. Continuing to build on professionals like Mr. Fiala within your group is a fantastic way to distinguish yourselves among the competition. It is with my hope that I can continue to have such a good business relationship with HYG. Thank you, Hampton Yacht Group in Seattle, for making my dream come true. 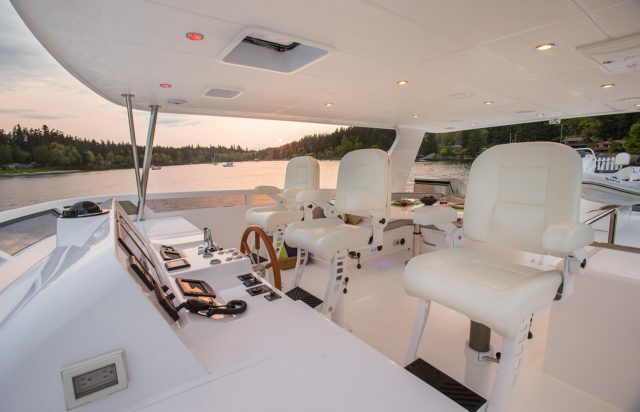 Endurance 658-10 "Ocean Suite" owner shares what set the Endurance 658 apart from other yachts that he saw - "As we looked further into the boat, we saw the fit and finish. We got into the engine room and under the holds and down below - it's all finished out. There was no comparison to any of the other builds that we looked at." Owners Bob & Debbie Towery comment on their build experience: "I especially appreciated the opportunity to go to the factory in Shanghai and work with Jeff Chen and the crew there. It made it that much more special because you met the people who built your boat. A lot of boat owners told us that we were never going to get our boat within 9 months of starting, but we were happy to prove them wrong." Endurance 658-11 "Gratitude" owner shares: "I think the thing that has impressed me the most about Robert and Hampton Yacht Group is that attention to detail and genuine interest in us and doing the right thing. It's really been amazing to watch the level of professionalism and personal concern that has gone into the relationship." Written by Peter Janssen, as seen in Cruising Odyssey Issue 45. 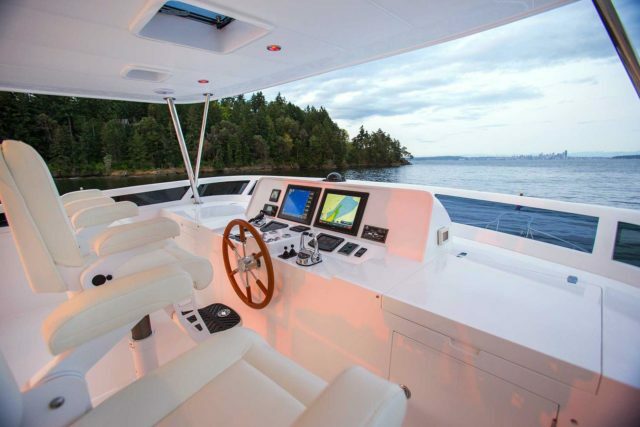 "A high-quality, unusually spacious, long-range cruising boat, the Hampton Endurance 658 is designed to be run by a couple, and it’s designed with redundant systems throughout to keep them safe at sea." Article by Roger McAfee"In developing the Endurance series, Hampton set out to produce one of the most stable hulls available to recreational boaters — a good feature for a series of long-range cruisers." "In developing the Endurance series, Hampton set out to produce one of the most stable hulls available to recreational boaters — a good feature for a series of long-range cruisers." "The luxurious interior of the E658 is apparent when one steps into the salon. Plush deep padded carpet, cherry wood paneling, and hand-fitted cabinets are just a few of the details that make the spacious cabin shine."